They called Secret Agent "X", the Man of the Thousand Faces. Armed with his irresistible gas gun, wearing impenetrable disguises, "X" infiltrates the darkest corners of the Underworld to crush all crime czars! The enigma of enigmas, Secret Agent "X" has been deputized by a high government official to battle the darkest, most diabolical enemies of America before they sink their poisonous fangs into the nation's healthy core. Faceless and unsung, "X" infiltrates these threats in a bewildering array of disguises. A past master of disguise, he infiltrated the Underworld to crush crime in all of its hideous manifestations. 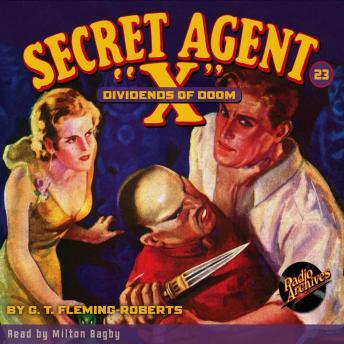 Here, Secret Agent "X" takes on the Dividends of Doom.